432 pages | 42 B/W Illus. While there is substantial research surrounding manufacturing and design-related product hazards, little has been written about supply chain product hazards and how they impact supply chain quality management. 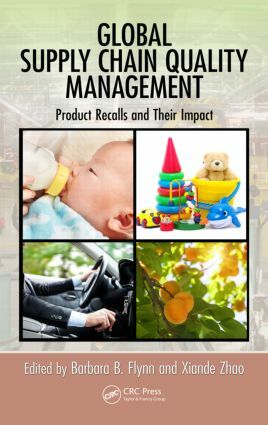 Filling this need, Global Supply Chain Quality Management: Product Recalls and Their Impact draws together key insights and research findings from a global research project on product safety and recalls. The book presents detailed case studies of six extended global supply chains within three industries: toys, food, and pharmaceuticals. These case studies cover U.S. companies with supply chains that extend into China and provide the perspectives of both U.S. and Chinese executives. It includes coverage of several highly publicized product recalls, including Ford Pinto, Extra Strength Tylenol, melamine-tainted milk, Mattel, and Toyota. Presenting detailed examples of both poor and best practices, the text supplies firsthand accounts from key players in well-known product recalls. It outlines an event study methodology that can help readers determine the true financial impact of a product recall announcement. It also describes how to conduct controlled experiments to determine the effect of various recall strategies on consumers. The book describes how alternative product recall strategies can influence consumers' perception of your organization's corporate social legitimacy as well as their future purchasing behaviors. Although the text focuses on product quality within the supply chain, it also sheds light on other sources of product hazards—sharing a wide-ranging perspectives and current methodologies. Dr. Barbara B. Flynn is the Richard M. and Myra Louise Buskirk Professor of Manufacturing Management at the Kelley School of Management, Indiana University. She received a D.B.A. in operations management from Indiana University, a M.B.A., with an emphasis in operations management and managerial economics, from Marquette University and a B.A. in psychology from Ripon College. Her previous academic appointments have been at Wake Forest University, Iowa State University and Louisiana State University. She is a Fellow of the Decision Sciences Institute and recipient of the Distinguished Service Award from the Decision Sciences Institute and the Distinguished Scholar Award from the Operations Management division of the Academy of Management. Dr. Flynn has received over $1 million in research funding from the National Science Foundation, the U.S. Department of Education and the Center for Innovation Management Studies. She is director of the High Performance Manufacturing research group, which studies the relationship between manufacturing practices and performance in various organizational and national cultures. Other research interests include global supply chain management, quality management, operations strategy, JIT and group technology. She has published articles in Management Science, Decision Sciences, Journal of Operations Management, International Journal of Operations Management and other leading journals, as well as a book and numerous book chapters. Dr. Flynn is former Editor-in-Chief and founding editor of Decision Sciences Journal of Innovative Education,and former Editor-in-Chief of Quality Management Journal. She is an Associate Editor of Journal of Operations Management and Decision Sciences. She serves on the Editorial Review Board of International Journal of Applied Quality Management, Production and Operations Management, and Benchmarking for Quality Management and Technology. Dr. Flynn is a past President of the Decision Sciences Institute and has held leadership positions within the Decision Sciences Institute, Academy of Management, Institute for Management Sciences (TIMS) and American Production and Inventory Control Society. She previously served as Director of the Indiana University Center for International Business Education and Research. At Indiana University, Dr. Flynn teaches M.B.A. courses in project management, service operations management, and operations management. Dr. Xiande Zhao is a professor of Operations and Supply Chain Management at CEIBS and at South China University of Technology. He was formerly Professor of Operations Management in the Department of Decision Sciences and Managerial Economics and The Director of Center of Supply Chain Management/Logistics, Li & Fung Institute of Supply Chain Management/Logistics at Chinese University of Hong Kong (2005 to 2012). During the past twenty-five years, Dr. Zhao was affiliated with a number of universities where he held several academic and administrative positions. In 2011, Dr. Zhao was specially appointed as "One Thousand Talent Professor" under China’s Global Search of One Thousand Talent Theme and served as Director of the Institute for Supply Chain Integration and Service Innovation at South China University of Technology. Previously he worked as an associate professor at City University of Hong Kong, Hampton University and University of Utah. He also held joint appointment as honored professors or visiting professors at Fudan University, Xi’an Jiao Tong University, Wuhan University, Nankai University and Tianjin University. Professor Zhao received his Ph.D. in Business Administration with a major in Operations Management and a minor in International Business from the University of Utah in the USA. He also received his MBA and MSc in Chemistry from the same University and a Bachelor’s degree in Chemistry from Nankai University in China. Professor Zhao’s expertise is in the areas of Operations and Supply Chain Management. His teaching and research interests focus on innovation, quality and productivity improvements in manufacturing and service organizations. He mainly applies empirical methodologies to investigate problems, issues and challenges of managing supply chain and operations in China. He has conducted research in the areas of Supply Chain Management, Quality Management, Service Operations Management, Service Innovation and Design and High Performance Manufacturing. He has published over sixty articles in refereed journals including Journal of Operations Management, Journal of Consumer Research, Production and Operations Management, European Journal of Operational Research, and International Journal of Production Research. He has conducted a number of research projects on service innovation and design, supply chain integration, supply chain quality management, innovation and supply chain learning funded by the National Natural Science Foundation of China and Hong Kong Research Grant Council. He has also provided training and consulting services for business corporations including China Mobile, China Telecom, DHL, Japan Airline, Ninjom, Glaxxo SmithKline, Towngas, Kerry Properties, Guang Zhou Steel Group and Beijing Commercial Bank.